NEWLY RENOVATED! 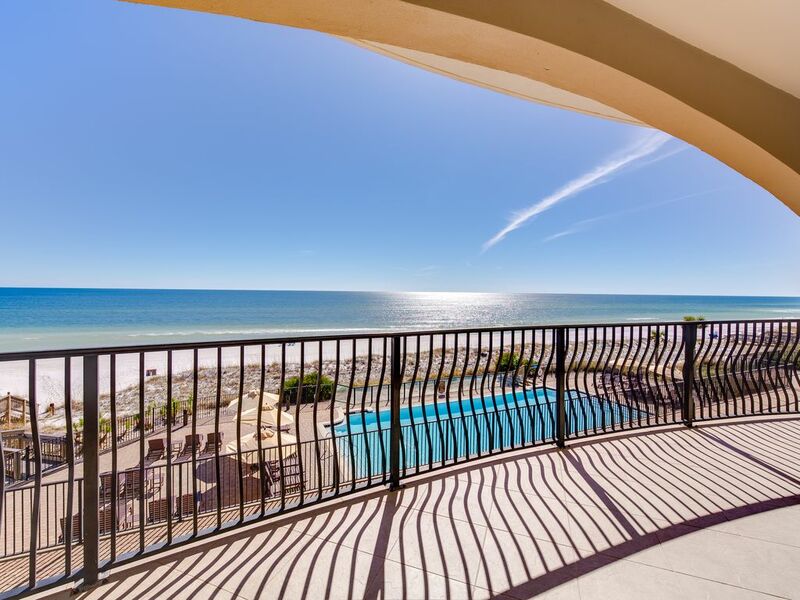 Luxury Gulf Front 2nd Floor Condo! Community Pool! DETAILS: This GULF front, recently renovated condo features 10 ft ceilings throughout, Master Bath with 6 ft. jetted tub and a shower surrounded in tumbled marble, Viking appliances, granite countertops, travertine floors, hardwood cabinets, ice machine for the beach cooler, a dining room table that seats 8 with 4 additional at the bar. Villa Coyaba 206 has all of the amenities you need to make an incredible vacation. The only problem you'll have is leaving! - Theater Surround System in Living Room with 42 inch High Definition Plasma T.V. We like Villa Coyaba very much. Great facility and close to everything. Our Unit #206 is decorated nice. Kitchen is stocked well. However, we felt the carpets had not been vacuumed, looking at the vacuum, the filters were in wrong. The tile floors were dirty. We have stayed at the Villa for five years. Feel it is not getting taken care of like in the past. Our door code and pool code were changed and we were not informed. We are glad you all enjoy Villa Coyaba and were able to join us for a vacation this year! We do apologize for the bumps along the way but we assure you we will share this valuable feedback with our team to make sure everything is addressed. Thank you for staying with 360 Blue, we hope to see you again soon! We had a wonderful time spending our family Thanksgiving in Destin! We cannot say enough about Charity and 360Blue. Charity went above and beyond to make a special vacation for our family of 9. We look forward to using 360Blue again! We are so happy to hear how much you loved your stay with us in Destin at Villa Coyaba! We are equally as thrilled that your experience with Charity and 360 Blue was a positive one and we can not wait to host you all again soon! We had the best time ever. We had 9 family members in our group and made memories that we will cherish forever. We loved the condo and it is decorated beautifully. We will definitely be back. Thank you for making this feel like our home away from home. This is the most precious photo ever! We couldn't be more happy that you and your beautiful family had such a wonderful vacation at Villa Coyaba! Thank you so much for staying with 360 Blue and we can't wait to have you back again soon! We like Villa Coyaba very much. Great facilities, location. Our unit was decorated and furnished with everything we needed to make our stay enjoyable. Hopefully the unit will be kept up. Like the parking garage convenience, however, the light on the ceiling wasn’t working well. There seemed to be a liquid dripping from the ceiling that took some spots of paint off our car. Maintenance was very good about taking care of request and keep the pool area nice. Thank you for choosing 360 Blue and Villa Coyaba! We are so happy that you enjoyed your stay on the Emerald Coast. We hope to see you back soon for your next beach getaway! We absolutely loved this condo. Very spacious, beautiful view, fully furnished with everything you could need, perfect location, private, and so much more. We didn’t even want to leave the condo/pool/beach because it had everything we needed. Would totally recommend and would for sure stay here again. There were 8 of us and we had plenty of room and never felt crowded. What a great group photo! We are pleased to hear that you enjoyed your stay with us at Villa Coyaba so thoroughly! The pool, beach and condo facility really do have everything you could need during your stay! Thank you so much for choosing 360 Blue, and taking the time to share your experience with us. Come back and see us again soon! Great location on the beach; close to anything you'd want from groceries, golf, shopping, rainy day movies, or dining out. We have been staying at Villa Coyaba for 5 years and love our experience each time. Rooms are always very clean and 360 calls you constantly to ensure everything you need is taken care of before, during, and after your stay. Would highly recommend the room and the service provided. What a gorgeous photo! You truly captured the beautiful views from this property! We are delighted to hear you enjoyed your stay with us so thoroughly. Thank you so much for choosing 360 Blue and taking a moment to share your experience with us. We look forward to helping you plan your next stay with us!